Yesterday I posted a “starving artist” cartoon featuring Frosty the Snowman, but wasn’t able to identify the artist. This morning’s advance was that Larry Schourup found a copy with the artist’s signature not cropped off — but he couldn’t read the signature! I’ve managed to decode it: Chad Carpenter, of the strip Tundra. 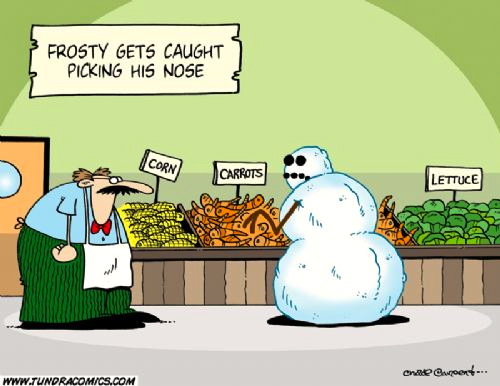 Snowmen are one of his specialties. Tundra has come up on this blog twice before, but in connection with penguins rather than snowmen: once on 6/12/13 (along with Bloom County cartoons), then on 8/5/13. Other recurring themes: wildlife, especially in the Arctic; and outhouses. This entry was posted on December 30, 2014 at 3:52 am and is filed under Language play, Linguistics in the comics. You can follow any responses to this entry through the RSS 2.0 feed. You can leave a response, or trackback from your own site.